NEW BLOG#Arrow shoots scenes for the #Elseworlds crossover episode. Garrett’s Monitor is looking very close to the comic book counterpart. 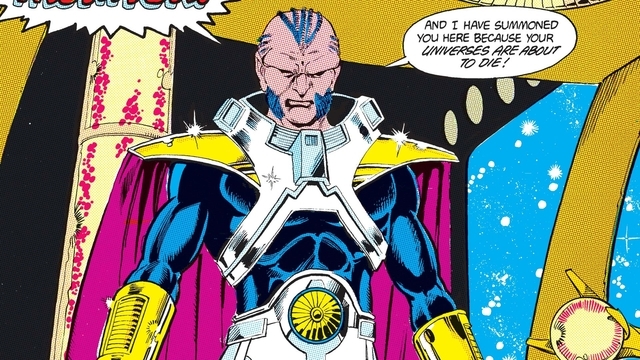 The Monitor was one of the primary characters in the classic DC Comics story Crisis on Infinite Earths. The Crisis dramatically changed DC’s continuity, and Elseworlds could potentially do the same for the CW’s Arrowverse. The Flash has introduced the concept of 52 other earths (actually, it’s 53 with Earth X) and many of them will be clearly represented in the crossover. The Monitor is the physical representation of all positive matter in the multiverse. For billions of years, he battled against his counterpart, the Anti-Monitor, the living embodiment of antimatter. To counter the Anti-Monitor’s ever growing strength, the Monitor collected a team from various earths to fight for him. Before the entire multiverse fell, some of the remaining universes were combined into one strong enough to defeat the Anti-Monitor. Once the Anti-Monitor was defeated a new Earth emerged. This new prime Earth was home to all the surviving characters from the previously separate worlds. If Elseworlds takes inspiration from the Monitor’s origins then we could see all of the CW’s shows sharing one earth. What do you think of this first peek at LaMonica Garrett as the Monitor? Do you think the Anti-Monitor could be far behind? Let us know in the comments section below.